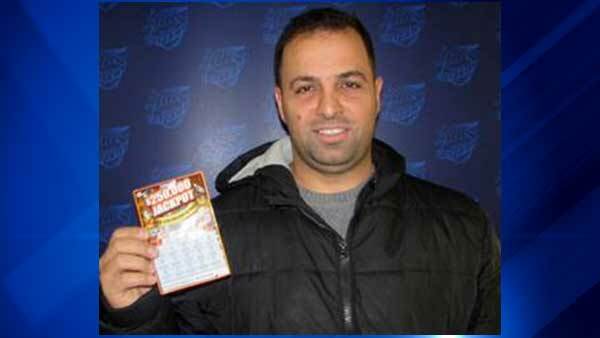 Steven Baqleh, 36, won $250,000 in the Illinois Lottery "$250,000 Jackpot instant game. CHICAGO (WLS) -- A married father of two turned a quick stop for soda at a Chicago store into a jackpot. Steven Baqleh, 36, won $250,000 in the Illinois Lottery "$250,000 Jackpot" instant game. "I was thirsty so I stopped at a store to buy a soda and this lottery ticket caught my attention," Baqleh said. "I still can't believe $5 turned into a quarter of a million dollars!" Baqleh plans to share his windfall with his family and invest. The winning ticket was purchased at Golden Mini Mart in the 1300-block of Morse Avenue in the city's Rogers Park neighborhood.